One of the most important things for paleo women to consider is what we are going to do about birth control. Should you take hormonal birth control? Is it really all that good? Bad? What happens to you when you’re on it? Of course, non-hormonal would be ideal for any woman who prioritizes having a natural menstrual cycle. Unfortunately, natural options are really not as abundant as they should be. Check out my top picks for low dose birth control options. This last one is pretty powerful–and popular–but it carries a modest risk of copper toxicity with it and may exacerbate bleeding and cramps during your cycle. The copper IUD also costs a pretty penny… somewhere in the neighborhood of $500-$1000. So, hormonal alternatives seem like a reasonable choice to many women. And they are. Side effects are often minimal (but again, I caution you against them), and many women are completely happy on the birth control pill. One way to give yourself the best chance of this happening is to go on a low dose birth control option. 0.02mg of estrogen is just about the lowest you can go and still prevent pregnancy. The reason many people opt for higher doses is that the side effects of spotting and breakthrough bleeding are more common with ultra-low dose birth control pills versus low dose birth control pills. Pills containing 0.02mg- 0.035mg.of estrogen fall into this category. They have a lower incidence of spotting and breakthrough bleeding. Other favorites of women interested in natural health are low dose “triphasic” pills, which better approximate the hormonal fluctuations a woman normally experiences. They also tend to be a bit better than average for weight maintenance and even weight loss. Finally, YASMIN and YAZ are two more low dose birth control pills containing 0.03 mg and 0.02 mg respectively of estrogen. What is unique about them is that they have a different type of progestin from the other pills called drospirenone (3.0 mg). 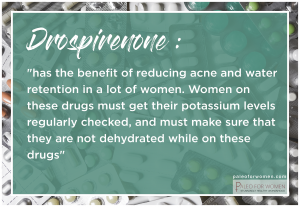 Drospirenone has the benefit of reducing acne and water retention in a lot of women. On the other hand, and this is a huge ON THE OTHER HAND, I have taken a similar substance and nearly died from a potassium overload, as well as developed a severe case of insomnia and anxiety that I am still dealing with two years later. If you take Yaz or Yasmin, please keep your potassium-containing foods to a minimum, drink plenty of fluids, and regularly check in with your doctor on your potassium levels. If you experience muscle weakness or heart palpitations, stop taking your pill immediately. So aside from the YAZ, those are my favorite low dose birth control pills. These are the ones I fear the least, as they are the lowest dose birth control pills I know of. If I were to use hormonal birth control (to be clear: I don’t, I use prophylactics) – these are the ones I would investigate using, or at least ask my doctor about trying. If you happen to struggle with acne and be on a birth control pill or contemplating it, take a moment and think about it. Each type of birth control pill has a different relationship with your skin! I discuss the nuances of hormone balance and specifics kinds of pills as they relate to acne in my brand new, 50% off program on the topic, Clear Skin Unlocked: The Ultimate Guide to Acne Freedom and Flawless Skin. If you happen to struggle with PCOS, it is worth learning about the condition and how to overcome it naturally before going on the pill. I describe how I did and how you can do it too in my manual on the topic, PCOS Unlocked: The Manual. Why no mention of nuvaring? Lower dose than any pill, continually delivered, put a new one in every 3 weeks and you can skip periods (and hormone drop) all together. But you can do that with any pill too, worth mentioning avoiding that useless placebo week. Hi, thanks for sharing this information. What about Lo Loestrin Fe? My 12 year old started taking birth control 5 months ago due to an ovarian cyst. She is very fit and muscular w/ low body fat(5’3 and 105 lbs.). I recently noticed cellulite appearing on her lower back and on the back of her upper thighs. Her face also looks a little puffy. I haven’t mentioned this to her as I don’t want her to feel insecure. Is this likely due to her hormone levels being too high from the birth control? Taking progestogens and also mirena iud made my face puffy, like I was injecting steroids. Progestogens build up in my body and it takes months to clear it. Just came here to say that another barrier method option that does not get mentioned a lot is the diaphragm. I used it on and off for 10 years with great success (i.e. no pregnancies). Hormonal birth control made me anxious and depressed, and the copper IUD gave me hideous cramps and heavy periods for a year, so it’s the only option I will consider aside from condoms. There’s a new diaphragm called the Caya that’s an updated version that I’m planning to check out soon. If you’re in a monogamous relationship and don’t need to worry about STDs but are sick of condoms, consider the diaphragm. They’re hard to get these days because nobody seems to remember they are an option, but I really hope that changes! Thank you for mentioning this! I was looking for an alternative to hormonal birth control (I’m doing so well off of it after I had my baby) and I totally forgot about these! I’m going to talk to my doctor about one tomorrow!! What are your thoughts about the hormonal (progesterone) IUD? If you need to use a hormonal birth control method, is there any advantage to the hormones being local (IUD) rather systemic (BCP)? I had quite enjoyed being off of the pill but have been feeling like I’ve really noticed some PMS symptoms once I ovulate and until I get a period (which I’ve found can still be a bit hit and miss even with the progesterone). I know I probably just need to give it a go to see. Do I need to use for a few months to see how it goes properly though…? Man, yaz gets a lot of hate but it’s honestly the only pill that was symptom-free for me. I tried around 4 different pills before landing on yaz, and they all had various bad effects – acne, menstrual pains, bloating, weight gain, mood fluctuations, etc. With yaz, even if I missed a pill or didn’t take it on time I was totally symptom free. And without birth control I often had incredibly debilitating cramps that became WAY more manageable with yaz. I stayed on it for 7 years (through most of my 20s) without a single issue. In the end, I think it’s really down to our own individual bodies. Nobody’s hormone levels are exactly the same and so different pills will affect each woman a lot differently. I’m looking at switching from YAZ to a different bc pill due to its side effects on me (chronic yeast infections and ZERO libido) however I definitely enjoyed that it didn’t make me break out. Is there a pill that is relatively easy going on libido that won’t make my skin flare up either? Unfortunately I need to take hormonal bc for my anemia and I know I’m asking for the best of both worlds here .. but hopefully there’s a middle ground? What about women who deal with depression normally during pms. Is there a birth control option that doesn’t exacerbate this issue? any good reviews or bad reviews for this birth control pill Microgestin?? I’m on microgestin after not having taken birth control for three years, and had two kids in the meantime. I’ve experienced breakthrough bleeding every day since starting it (not surprising due to stage 4 endometriosis) severe bloating, and panic attacks and anxiety (I have no history of mood or mental disorders). I have been taking it for such a short time but the side effects have been so frightening that I’m quitting taking it immediately. I would look into other options. Hi there. I started Junel 4 days ago and immediately began waking up in the morning with heart pounding anxiety, which is typical of panic attacks I used to get but not in a long time and not unprompted. I didn’t take a pill yesterday but I’m not much better this morning. I wonder if I should skip it another day and see if I feel better or continue taking it and see if it balances out? The same thing happened to me 11 years ago in college with the Nuva Ring. I became suicidal after having it in for 4 days but felt entirely better 24 hours after taking it out. It was terrifying, I was literally struck suicidal, and I had never felt anything like that before so I’m a little scared of this. My daughter has reacted terribly with Jadelle/Norplant 2 (Levonestrogel) and two contraceptives pills Ava 30 (Ava also contained Levonestrogel) and Zoely which is supposed to be a new generation pill. Her anxiety skyrocketed on Zoely. She gets VERY depressed – to suicidal stage, rages, high emotionability and lots of anxiety. I’ve taken her off all hormonal contraceptives at the beginning of Nov. She’s been so much better and life is improving week by week. But now she’s wanting to try another pill. I’m petrified of another bad reaction. Do you think I should strongly discourage her from going down this path again as it was so treacherous for us all. I’m so scared. My daughter was on microgynon combined pill for 3 months it made her really down and depressed. She was going around half mad in temper all the time. After sitting studying why she had went from being happy to this complete emotional mess I realised this just started few weeks after her starting the pill. I took her off it straight away after going online reading reviews on it. We went to gp who recommended she stay off it for 3 months till it was completely out of her system. Inside a week after stopping she even noticed herself that she felt a lot better. She went back to gp as she really needed contraceptive he gave her Cileste. Now at the end of her first three months on it the exact same symtoms have returned. Crying all the time , not wanting to leave her room , very depressed , just an emotional mess. I have stopped her from last night taking this pill. Just wondering has anyone any recommendations of a low dose pill that doesn’t affect mental well-being. I just got on “Blisovi FE 1.5/30” with norethindrone acetate 1.5 mg and estradiol 0.03 mg. This is to treat extremely painful periods. Have you heard of this birth control? Maybe try a different mini pill? Can you get rid of the pulling out ‘method’ as it is not a method? What category (ultra low-dose, low dose, or triphase) would Natazia birth control fall into? Thanks!